Re: What are the "Adams"? Akko wrote: Oh, you mean this one? Are you sure those aren't just a fashion statement? DarkBluePhoenix wrote: Are you sure those aren't just a fashion statement? ^ Well, with it being that old, it could be DSS Chokers. But I highly doubt the other pilots have the same "punishment" involved, otherwise they would have brought that up during Asuka's fight. DarkBluePhoenix wrote: ^ Well, with it being that old, it could be DSS Chokers. But I highly doubt the other pilots have the same "punishment" involved, otherwise they would have brought that up during Asuka's fight. This isn't compelling reasoning. Why would it have needed to be brought up during the fight in particular? Seems arbitrary to me, especially if the dramatic reveal is intentionally being saved for the next film. On the other hand, it makes perfect sense as a contingency to keep Mari and Asuka collared as well, particularly since both have gone beyond safe plug depths in their Evas and have had their humanity compromised, same as Shinji. Asuka in particular came in contact with an Angel and shows signs of angelic influence. I shouldn't even have to mention that the Evas are incredibly dangerous weapons even when they aren't opening sky portals. Why wouldn't a group like Wille want to have some sort of failsafe such as the collars? ^ Well, they made the DSS Choker out to be more like a punishment than anything else because they don't trust Shinji considering he doesn't listen to directions, and he's a known Impact Trigger to boot. And I really do think during Asuka's fight it would have been brought up considering how adamant Ritz was to blow Shinji to kingdom come as NERV was taking him away, she would have brought up the same thing during the fight if Asuka (or Mari) were so equipped, something along the lines of "the DSS Choker is primed just in case"
Who should have brought it up? 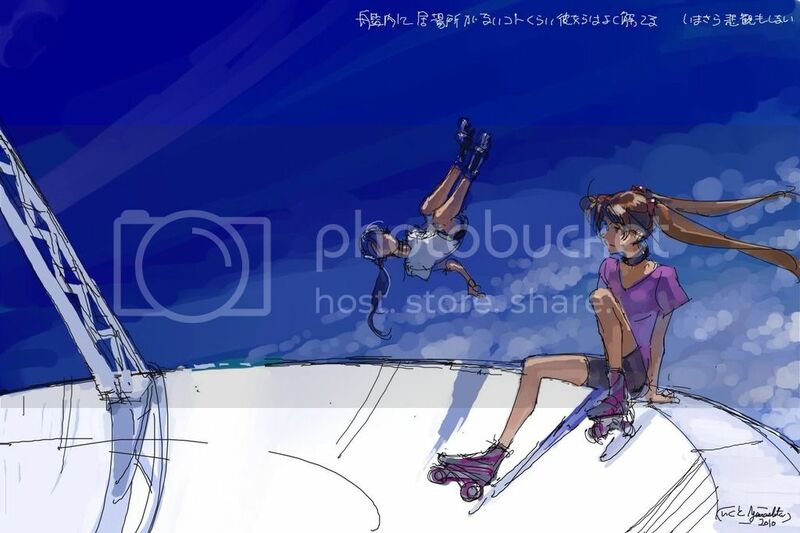 Asuka and Mari had no reason to do it, and Misato and Ritsuko were never showed having any reaction to the Eva fight (except for the "Shinji-kun..." from Misato). ^ it's just all the fuss made about the collar, it seems like it would have been brought up. But honestly, Shinji must be the only to have it, they don't trust him, and Ritsuko wouldn't need to give Misato a remote she's already have if the other two had DSS Chokers on. The more I read here, the more it confirms why I despise what happened in 3.0. They are all expendable. It isn‘t expected who survies, when only the mission matters. WILLE ‘ll be hunted as soon when they eliminate NERV. Sorry, I don't get what you're saying. What says anyone is expendable? After all, Misato didn't kill Shinji when she had reason to, and Asuka picked him up rather than leaving him. Wille's mission is survival, which is the opposite of thinking people are expendable. Who will hunt down Wille if they eliminate NERV? pwhodges wrote: Sorry, I don't get what you're saying. The survival of humanity itself is the only higher priority than that of WILLEs members and those with higher authority than WILLE would use order A-801 against them. And Eva Pilots end up the same way as Replicants in Blade Runner when they get retired. Order A-801 is part of the series continuity, not the films. We do not know whether any higher authority even survives in 3.33. We haven't seen any Eva pilots retire, so anything about the process is pure conjecture; unless you want to consider the prevention of Shinji from entering an Eva at the start of 3.33 as "retirement" - but that did not lead to his death, even given multiple opportunities. DarkBluePhoenix wrote: ^ it's just all the fuss made about the collar, it seems like it would have been brought up. But honestly, Shinji must be the only to have it, they don't trust him, and Ritsuko wouldn't need to give Misato a remote she's already have if the other two had DSS Chokers on. Asuka having a similar device makes a lot of sense to me: if they put anti angel seals on the eyepatch they probably put other types of safe measures in case her angel eye does something weird and it gets out of control. No one would want another Bardiel accident with Unit 02 going crazy destroying everything. That would mean that Shinji is free unlike the others pilots and Asuka will probably die with that dss choker activated cause Shinji couldn't kill the angel right in the final battle and Shinji wont be able to save her cause he doesnt have the same powers as Kaworu and in the momentuum of the movie it will be revealed that the angel have the same face as a certain Kaworu... OMG ! airman4 wrote: That would mean that Shinji is free unlike the others pilots and Asuka will probably die with that dss choker activated cause Shinji couldn't kill the angel right in the final battle and Shinji wont be able to save her cause he doesnt have the same powers as Kaworu and in the momentuum of the movie it will be revealed that the angel have the same face as a certain Kaworu... OMG ! ...what? Why would Asuka's DSS choker (if she has one) be activated if Shinji didn't kill the angel? I know, i'm sorry, it was a joke post. The Cruel wrote: The more I read here, the more it confirms why I despise what happened in 3.0. They are all expendable. It isn‘t expected who survies, when only the mission matters. WILLE ‘ll be hunted as soon when they eliminate NERV. Welcome to the desert of the real. While the very concept of sending 14-yo kids to the war is abhorrent, this is what comes in package with a war that may end not with simple extinction of the mankind, but with the literal apocalypse or equivalent (sayonara, afterlife). pwhodges wrote: Who will hunt down Wille if they eliminate NERV? Adams, maybe? After all they resemble the good, old, New-Age style aliens watching over the Earth and waiting for the mankind to grow up and ascend the higher plane of existence or whatnot, to make the contact then and establish permanent communication link. But if the mankind chooses to downgrade to its primal animal instincts instead, I think they can take some countermeasures. But will the Adams be able to escape the constraints put on them? Hm. I don't know, I just always thought that the four Adams we see in Misato's flashback are only few members of a whole species, so that more Adam visitors may appear later and make the decision about the mankind's fate basing on what happened to their fellows and how they were treated. But this is only my wild guess. I'm thinking Adams are either iterations of kaworu ascended or melded with something, repeats of ascended units one or 13, or Liliths being confused for Adams. And this in between is quite evident at his place in NERV.